Like the surf that keeps rolling up on Venice’s shore, no matter what, the idea of restoring our cityhood just won’t go away. Unfortuately, none of the candidates for Los Angeles City Council District 11, which supposedly represents Venice, support Venice cityhood. They would rather see Venice go down with the ship which is the city of Los Angeles. Cityhood for Venice not a new issue. In 1925, there were immediate claims of fowl when the supporters of annexation by Los Angeles finally won an election, thus ending the independent city of Venice. In 1940, there was a bill in the California State Senate to restore Venice cityhood. During the 1960s and ’70s, it became a movement, called Free Venice. Our local paper, the Free Venice Beachhead, has always been a part of the demand for restoration. And, in the 1990s, a new committee was formed that actively campaigned for cityhood. During the “00s,” community forums took place under the auspices of the University of Venice and well-reasoned articles appeared in the Beachhead. What’s different today? A couple of things. More and more Venetians are becoming disgruntled with the city of Los Angeles. Previously, the megalopolis was able to quietly siphon of much more money from Venice than it returned. Lately, its financial problems have made L.A. look for any way to make a buck in Venice. This includes raising the price of parking and the tickets that everyone eventually gets on “street cleaning” day, whether there is any actual street cleaning or not, schemes such as the “Big Wheel” and the “Zip Line,” which include revocable promises of sharing revenue with Venice. Waiting in the wings are more metered parking, more amusement rides and more crowds, more fees for city services such as repairing broken sidewalks, allowing advertisements everywhere including Ocean Front Walk, renewed inspections by code enforcers and a wholesale reassessment of Venice’s taxable property values. The Los Angeles City Council on June 5, 2012, without the glare of publicity declared a fiscal emergency. This enables the Mayor to make massive layoffs (just what we need, more people out of work) and cuts in services. There is a projected deficit of $199 million for fiscal year 2013-14 and $315 million for the following year. Unless it squeezes the life out of Venice and other “holdings,” it is on the path to bankruptcy. Meanwhile, the city is trying to make the poorest among us pay for their mismanagement by raising the sales tax, the most regressive tax on the books. At the same time, Venice is becoming wealthier. Property values are on the rise again, which could make a great tax base for the city of Venice. As an independent city, Venice would be larger than half of the 88 current cities in Los Angeles County. Some critics have said that Venice would not be viable without a shopping center to tax. Anyone who has been past the intersection of Rose and Lincoln knows that Venice now has a shopping center, even if it is mainly one hugely profitable Whole Foods Market. It is only a matter of time before a new proposal to redevelop Lincoln Center, at California and Lincoln, is floated again. As Lincoln Place becomes repopulated, it makes sense to provide stores that cater to the locals, and are a source of revenue for Venice. For anyone seriously interested in regaining cityhood, it might be useful to look at how other cities of Venice’s size gain their revenue and what they spend it on. A nearby city of approximately Venice’s size is Culver City. More than 50 percent of Culver City’s revenue comes from three sources: Sales Tax, Utility Taxes and Business Licenses. Most, if not all, cities’ budgets are easily accessed with an internet search. 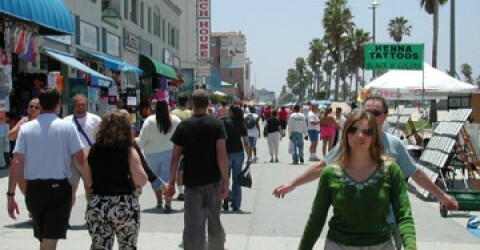 In Venice, we would likely gain much of our income from our largest industry, tourism. This would include sales tax, hotel taxes, parking revenue, taxi fees and other ways to derive at least some income on the tens of thousands who descend on Venice each day. In recent years, Venice has been a war zone of neighbors battling each other over parking, poverty and development. Some Venetians believe that such divisions make it impossible for the community to come together in favor of cityhood. However, the Coalition to Save the Venice Post Office has brought together groups and people who usually don’t get along. It includes this newspaper, the Venice Neighborhood Council, the Venice Stakeholders Association, Venice Peace and Freedom, SPARC, Venice Arts Council, Venice Chamber of Commerce, various poets, writers, artists, and business people. Personal attacks and extraneous issues are frowned up by most of the participants. As a result, Venice has been able to speak with one voice and to wage a credible fight to save one of our most historic buildings. Unfortunately, in our effort to save our historic post office, we were up against the federal government (USPS) and a movie mogul, Joel Silver, who bought the building and privatized it. Can we also unite for cityhood, and this time wage a winning campaign? Some Venetians have told me they are wary of cityhood because the other side (homeless haters or sixties hippies, take your pick) would assume power. So it comes down to this choice: would you rather be ruled by the crooks in L.A. City Hall or “those people” down the block. It also come down to a question of democracy. Can you have anything resembling democracy in a jurisdiction (the city of Los Angeles) of more than four million people? Democracy is more than having a secret ballot election periodically. It is at heart, a question of how much control, power, influence the average person has in the social maelstrom swirling about around him or her. Venice is a potential city of 40,000 people. It can be walked, biked or skated from one end to the other. Anyone elected to a Venice City Council would have to live in this small area. Does anyone know where the 14 men and one women who currently comprise the Los Angeles City Council live? Does anyone know where the department heads, who have great decision-making power live? In Venice, civic-minded people would know. They would see their councilmembers and hired staff at the market, the hardware store, or out riding their bikes. The potential for real democracy in a city of 40,000 would be much greater than it would be in an entity of millions. Would people you and I don’t agree with, or like, be elected to office? Yes. Would people you and I do agree, and like, with be elected to office? Yes. This is how democracy works. In a town or a society where everyone thinks the same, you wouldn’t need democracy. But Venice hasn’t been that homogeneous since the Sixties (and probably wasn’t even then). So yes, we would have disagreements, hard fought elections, and disagreeable people. But we would likely have less disputes that we do at present. If you search carefully through the major controversies that we in Venice have suffered, you will ultimately find an instigator from the L.A. city government. This was true in the abolition of the progressive Grass Roots Venice Neighborhood Council in 2006, the Overnight Parking Districts, the beach curfew, and the Big Wheel, among others. This does not mean that there weren’t locals who were more than happy to make common cause with powerful downtown interests. However, if Venice was its own city, no one would be able to bulldoze (in more ways than one) their pet projects by relying on these powerful backers. Accommodation, not confrontation, would become the political game in small town Venice.